The Brooklyn-based band Love Always is only a year old, but its seasoned members are a supergroup of sorts, crafting musical vibes with Jamaican/roots, rocksteady, reggae and lovers rock influences. Patricia Verdolino (vocals), Michael O’Connor (guitar), and Andy Shaw (bass) are original members of 90s Ska band Metro Stylee. 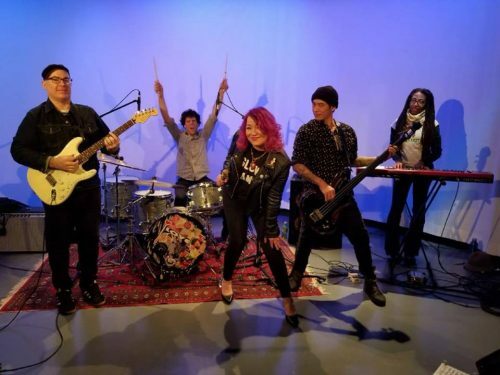 Shaw also plays bass in the popular Brooklyn band Bikini Carwash, while drummer Ron Salvo plays with .357 Lover and keyboardist Jeannie Oliver played in Si Se. Love Always is currently in the studio recording an EP and is testing out their new songs live. What better way is there to warm up this weekend than with live music from Love Always? The band will perform two sets this Sunday, Dec. 2, at 2 p.m. and 3 p.m. at the Greenpointers Polar Vortex Holiday Market at 67 West St., we hope to see you there.